Alpenfire Cider releases Discovery Trail “Cider on the Go” in collaboration with the Olympic Discovery Trail. South Puget Sound Community College seeks a creative, dynamic, and collaborative individual to fill the position of Director of Craft Brewing and Distilling in the Craft Brewing and Distilling Program. Applications will be accepted until January 2, 2018. Please follow link below for a full job description. Bad Granny Black Currant hits the shelves!!!!! Bad Granny Hard Cider is excited to announce the release of our Black Currant hard apple cider! Beginning this month, the Black Current will be available in kegs and six packs of 12-ounce cans. You can find the Black Currant almost everywhere!! Bars, restaurants, and other fine retailers such as Total Wine and More. Black Currant is fruit driven, with a crisp dry finish that delivers depth and complexity. Crafted with our proprietary champagne yeast strain, using 100% WA grown apples, Black Currants are jam-packed with powerful antioxidants, including Vitamin C. Cider and Beer lovers alike will love the notes of blackberry, cherry with just a hint of lemon. At 6.9% ABV, you can’t help but enjoy the dark side of Granny, a little pucker, not too sweet….just like Granny! Although Bad Granny’s heritage lies in the beautiful orchards of Washington State, her creative genesis found its roots beside her sister product, the Karma Vineyards Methode Champenoise Sparkling Wine. Owners Julie and Bret Pittsinger opened Karma in the fall of 2007, creating the first traditional style champagne in the region. 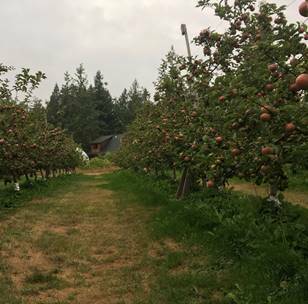 As the brand grew to be one of the favored bubblies in the State of Washington, Bret saw an opportunity to partner with his long-term relationships of apple growers that he’d cultivated over several decades. The chemistry between the quality of fruit and the knowledge of the traditional French champagne method, created a unique Hard Cider …and BAD GRANNY was born! 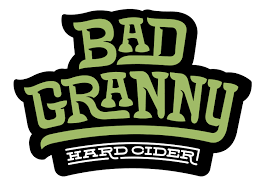 Bad Granny has five styles to try: Original, Black Currant, Rainier Cherry, and (soon to be released) “In the Flesh” and Cider Master Reserve. Come visit us at Karma Vineyards, 1681 S Lakeshore Road, Chelan, Washington. Schilling Cider is accepting applications for an Assistant Cidermaker for a few more days. Please follow this link for a full job description or to apply. HELP US LIGHT THE WAY AT FINNRIVER WITH A SOLAR POWERED CIDER GARDEN! We’re excited to support our friends at Finnriver in constructing a new solar energy system at the Chimacum Cider Garden, to create renewable energy and to be an inspiring educational resource. Finnriver is embarking on a crowd-funding campaign this month to generate funds for matching a USDA Rural Energy grant to install a 40 Kilowatt renewable energy system at the Cider Garden that, if completed, will be the largest solar installation in Jefferson County. It’s all about the love and the light! Visit the link here to view their fun Solar Powered Cider Garden video and to contribute to this important project! With the arrival of fall and the inevitable arrival of winter, North Idaho Cider has released its fall/winter seasonal Chai Spiced Cider. “This creation is our offering of the comforting spices of fall and the holidays using real cinnamon, clove and cardamom. A touch of ginger provides a crisp freshness while the finish is dry and clean with subtle notes of vanilla” according to Keith Allen, Co-Founder and Chief Marketing Officer. North Idaho Cider uses 100% fresh pressed Northwest grown apples to make its dry ciders. Chai Spiced pairs well with many foods including fall soups and dishes with turkey or pork. It’s ABV is 6.9%. North Idaho Cider’s Chai Spiced is available in bottles and on tap in it’s tasting room in Hayden, ID and bottles are available at select retailers in North Idaho and in the Spokane WA region. All North Idaho Cider bottled products can be ordered online and shipped throughout the United States. Established in 2014, North Idaho Cider is a partnership of three good natured guys, Keith Allen, Matt Peterson and Jeff Selle. Born from an initial interest in brewing their own beer, curiosity led them to try their hand at making hard apple cider. Over time and with deliberate collaboration they collectively developed an affinity for dry ciders with great apple flavor and influences of other fruits and natural ingredients. North Idaho Cider has a taproom and production facility in located at 11100 Airport Rd, Bay 5 in Hayden, ID 83835. For more information visit www.northidahocider.com and follow @northidahocider on social media. October 5, 2017… A one-week trade mission to Asia will have a decided emphasis on Oregon food and agriculture as Governor Kate Brown and Oregon Department of Agriculture Director Alexis Taylor lead a delegation that will focus its efforts on doing business with Japan, the state’s top export market for agricultural products. Among the delegates are representatives of eight Oregon companies connected to food and agriculture who hope to make a strong impression throughout the week. The ag delegation includes some companies experienced in selling into Japan and others who are making their first effort: Willamette Valley Fruit Company of Salem; OFD Foods of Albany; Northwest Hazelnut of Hubbard; Ponzi Vineyards of Sherwood; 2 Towns Cider of Corvallis; Bossco Trading of Tangent; Weaver Seed Processing of Scio, and Pacific Seafood, headquartered in Clackamas. There will also be a strong presence by Oregon State University and the Portland-based Food Innovation Center. Director Taylor and two ODA staff members experienced in the international market will provide assistance to all companies making the trip. Taylor says ODA’s expertise provides value to those who are part of the trade mission. The trade mission begins with a one-day stop in Hong Kong, a gateway for trade into Asia, that includes a tour by Governor Brown of Cathay Pacific’s new air cargo facility. Nearly a year ago, Cathay Pacific began direct air cargo flights from Portland to Hong Kong which are key for export of Oregon’s perishable ag products such as fresh cherries, live Dungeness crab, and cut greens. In response to demand during the harvest season, Cathay Pacific added two extra flights each week through the summer. From Hong Kong, the full agricultural delegation will join the governor in Japan for the balance of the trade mission. Among the highlights next week will be an Oregon reception in Tokyo with key customers of Oregon food and agricultural products attending, a panel discussion of women in leadership from Japan and the US, and a special “Doing Business in Oregon” seminar targeting Japanese food processing companies that may want to open operations in the state. Governor Brown and Director Taylor will be part of the women in leadership panel. The seminar for food processors gives OSU and the Food Innovation Center a chance to be introduced. OSU’s research chef, Jason Ball, and the FIC’s Sensory Program Manager, Ann Colonna, will demonstrate some of the resources available to Japanese companies interested in operating in Oregon– the same resources available to US companies. Specifically, Colonna will conduct a taste test using four different craft ciders from Oregon. In the past three years, Oregon has gone from having zero craft ciders in the Japanese market to eight brands. Chef Ball will also showcase several Oregon ingredients– including hazelnuts, blackberries, rockfish, and freeze dried chicken– as part of uniquely created dishes that will be sampled by Japanese attendees. In Japan, food service is a huge sector. Japanese consumers are increasingly dining out. They also expect top notch quality. That’s why Japanese food buyers are looking for quality ingredients and products from Oregon to sell into restaurants and retail grocery stores. Rank and title carry a great deal of importance in Japan. Having a governor and a state director of agriculture on the mission helps cement existing relationships and opens some doors to meetings that the accompanying businesses would not get otherwise. For a state that doesn’t have the population to consume all that it produces, an export market is important. And there hasn’t been an export market any more important than Japan. Maintaining strong relationships in Oregon’s top export market and building new ones is a lot easier done face-to-face. The upcoming governor’s trade mission is the type of event that helps make it possible. For an audio recap of this story, please go to https://wp.me/p52oQB-mt and scroll down. A celebration of traditional cider apples and cask-conditioned ales, the Pressing Matters Proper Cider and Real Ale Festival will be held at the Cider Riot! Pub and Production Facility on 807 NE Couch St in Portland, November 18th from noon to 7pm. Just as fine wine is pressed from specific wine grape varieties, the best cider is pressed from specific varieties of apples. Sometimes referred to as “spitters” these bittersweet and bittersharp cider apples pack a flavorful punch. In England more cider apples are grown than eating apples. Here in North America only a small amount of cider apples are being grown, but more and more are planted each year as cider continues to grow in popularity. “At Cider Riot! we’re lucky enough to make cider from bittersweet and bittersharp cider apples grown at two established orchards in Yamhill County and we love the results,” says Cider Riot! founder and cidermaker Abram Goldman-Armstrong. In addition to cider there will be traditional cask-conditioned ales from some of the region’s finest brewers, Morris Dancing, cider apple tasting and cheese pairings. Advance tickets are $25 and include a logoed tasting glass and 10 tasting tickets, $30 at the door. Single tickets and disposable cups are also available. Additional tasting tickets are $2 each, and 4 oz tastes of ciders cost 1-2 tickets each depending on price and rarity of the ciders. Cider Riot! ciders on tap: Shaken Tree Yarlington Mill Cider, Burncider Dry Draft Cider, 1763 Revolutionary West Country Cider 2015 and 2016 vintages, EZ Orchards Collaboration, 2016 Kingston Black, Porter’s Perfection. About Cider Riot! Founded in 2013 in a North Tabor neighborhood garage, Cider Riot! is dedicated to producing flavorful refreshing dry ciders from Cascadian grown apples. Cider Riot! ciders have won awards in numerous local and international cider competitions including the prestigious Bath and West Show in Somerset, England. In 2016 Cider Riot! opened its pub and production facility at 807 NE Couch St, just off East Burnside. The pub is open 4-11pm weekdays, and Noon-11pm weekends, shut Tuesdays. Sip Northwest Magazine Announces the 2017 Best of the Northwest! (Seattle, WA – October 6th, 2017) – Sip Northwest magazine is excited to release its sixth annual Best of the Northwest issue. This collector’s edition showcases the winners of the grand tasting competition from wine, beer, spirits and cider, along with top Northwest beverage trends, locally focused restaurant and bars, upright industry influencers and more. An open call for submissions last spring drafted more than 530 entries from wine, 263 beers, 114 from spirits and 130 ciders. The magazine recruited an accomplished, qualified group of nearly 80 of the Northwest’s premier palates to assess and determine the top four, plus Judges’ Picks, in each respective beverage category. Together, Sip Northwest and the judging panels built a comprehensive listing of medaled winners to add to readers’ liquor cabinets, beer fridges, wine cellars and cider coolers. Sip Northwest’s 2017 Best of the Northwest issue is a versatile compilation of the top billing beverages of the year. To read the full list of winners, please CLICK HERE. Sip Northwest magazine is a locally owned-and-operated quarterly magazine that showcases the wines, beers, spirits and ciders of the Pacific Northwest. The award-winning magazine was created to be the leading authority and resource on the emerging and flourishing beverage scene, covering everything from recipes and the culture to the faces and the stories behind all that is produced in the Northwest. Port Townsend, WA — Alpenfire Cider is celebrating a new decade of producing organic cider in the Pacific Northwest with the release of new vintages and a new look to the family owned brandmark. As part of this celebration, Alpenfire will be launching their much anticipated Cider Club which will allow members access to limited release vintages and special events. A new website showcasing the revamped label designs will be launched on October 1st. On October 13th, Alpenfire will also be hosting a cider-paired five course dinner, aptly named “Firestarter”, at Port Townsend’s newest restaurant, Finistere. https://restaurantfinistere.com Tickets are available for this limited seating dinner at https://www.tickettailor.com/checkout/view-event/id/109435/chk/50bc. Alpenfire’s certified organic orchard was established in 2003, when Steve (Bear) and Nancy Bishop planted their first 900 trees. “Our understanding of cider and a determination to produce exceptional cider was formed travelling through the cider regions of England, France, and Spain” says Bear. “We came home determined to craft ciders unlike anything else produced in the United States.” They released their first two commercial ciders in 2007. Today, Alpenfire has an established track record of awards and recognitions for their ciders. 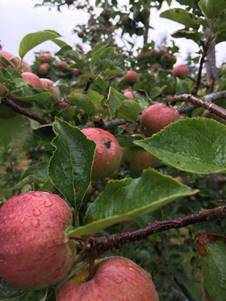 When the orchard was first planted it was for a specific blend of cider, as the orchard has matured, so has the range of that blend. Apples grown include bitter-sharps like Kingston Black and Foxwhelp which give the ciders an acidic balance and bitter-sweets like Vilberie and Muscadet de Dieppe which provide an enticing earthy flavor and tannic structure. Alpenfire ciders are given a minimum of eight months to age before blending and bottling, they are not filtered or fined, and most are bottle conditioned. To learn more about Alpenfire Cider and their products please visit their website at https://www.alpenfirecider.com/. Their tasting room is open every Saturday and Sunday from noon till 5pm through December 3rd and will re-open again in the Spring of 2018. For more information on the tasting room, email info@alpenfirecider.com. For information on sales and distribution, email Philippe Bishop at pb@alpenfirecider.com.